Knock knock! 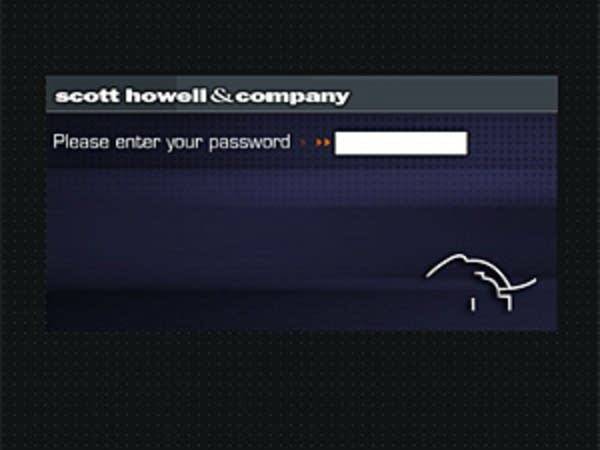 Scott Howell & Co. In its brief and, thus far, only statement regarding the ad controversy, the Klobuchar campaign said its former communications director exercised "poor judgment" because she watched what appeared to be an unreleased campaign ad for Republican Mark Kennedy. The campaign says Tara McGuinness also asked other campaign staff to view the ad. McGuinness did not return Minnesota Public Radio News' telephone calls. In its statement, the Klobuchar campaign said a blogger contacted McGuinness about the ad and then sent her an e-mail link to it. The campaign says the blogger indicated he used passwords to gain access to the commercial. The blogger, Minneapolis resident Noah Kunin, says he did nothing illegal because the Web site was accessible to the public. But the consensus among experts contacted by Minnesota Public Radio News is that the blogger crossed a legal line. "The blogger certainly did something illegal and something that is obviously illegal," according to Bruce Schneier, the chief technology officer for Counterpane Internet Security, a California-based company that monitors computer networks. "If you deliberately try to bypass a password block and you do, that is the equivalent of breaking and entering. It's equivalent to going to somebody's door and trying a bunch of keys randomly and then saying you got in and saying 'Well, I didn't break in. I had a bunch of keys. I tried them and one works so what's the problem?' There is a problem and the courts hold there is a problem," he said. The Klobuchar campaign says it reported the incident to the FBI. Kunin, the blogger, says that regardless of how he got to the site where the Kennedy ad appears, that site is not password secured; anyone can access the page by simply clicking on the URL. Kunin's attorney, Steve Silton, says Kunin had no idea he was in an area that was not public. "If you think about it, anytime you even enter a Web site using your own password, it always says 'if you're not the person who this is, click here,' you can't access this information. None of that -- and let me stress that -- none of those type of disclaimers in any way, shape, or form was on the Web site. That we have verified, so there was nothing there that indicated this was anything more than public information," Silton says. But Silton and his client acknowledged Kunin gained access to the ad only after typing in the name of one of the media consultant's clients. Today a visit to the Web page Kunin has a white box and text that reads, "Please enter your password." However, the Web page is not encrypted. Kunin's publicist held a news conference with two legal experts who said it's not always clear whether access to a Web site is authorized or not. University of Minnesota Law School professor Dan Burk says even if there were no security on the page, that doesn't mean it was a "public place" that anyone should feel free to enter. "You can imagine an analogy to walking past someone's physical property, past their land and seeing something interest or something that's out in plain sight. You're then not permitted to enter on to the land and take that material," Burk says. Burk sees three distinct areas of state and federal law where there may well be violations. Was there unauthorized access to the site? Was there trespassing? Were copyright laws broken? The legal implications aside, what matters in the short term for both the Kennedy and Klobuchar campaigns is whether the scandal will change the dynamics of the race in which Klobuchar has consistently been running ahead of Kennedy in the polls. Tom Hollihan, a professor at the University of Southern California's Annenberg School of Communications who studies politics, ethics and the consequences of scandal, says there's no question there's been an ethics violation. He says the least Klobuchar could do was to demand McGuinness' resignation. The political question is whether voters will hold the candidate accountable for her staff member's behavior. Hollihan likens Minnesota's unfolding ad controversy to the Watergate break in. Still he doubts it will have a dramatic impact on the race. "As ethical violations go, my guess is this one, while it may create some good news coverage over the short-term, is not really very likely to have a lot of stickiness to it, in part because the public has already become so cynical about politicians that they increasingly believe that this kind of stuff happens all of the time and that these guys will do anything to win and, you know, I think there's already a sort of skepticism that pervades our political culture, unfortunately," Hollihan says. The FBI did not return MPR's telephone inquiries as to whether it is investigating the possibility laws were broken by either the Klobuchar campaign or the blogger that directed McGuinness to the ad.